Well, preshoots always lead to wedding shoots, and here is my most recent one. 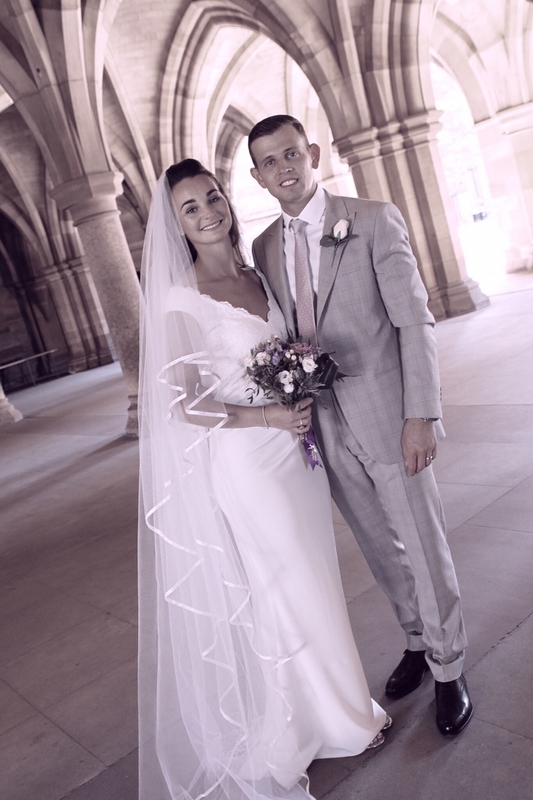 The lovely Jen and Stuart got married in Glasgow university in a moving humanist service at the start of July. It all started as it so often does with a waiting groom and best man. In this case, the very handsome Fraser was on-point. Again, the sun was splitting the skies, and the prospect for my preferred shallow depth of field shots was poor. However, my 5D was employed so that the sensor at least was full-frame. I also used my Olympus throughout the day, but more of that later. Comfortingly for everyone concerned, Jen and her parents arrived, phew! And didn’t she just look gorgeous? This is Jen just before she entered the chapel. And again with mum and dad. This was an unstaged shot of Jen’s dad walking her down the aisle; there is motion in it that I didn’t intend, but it captures a lovely moment. This one a moment later, actually froze the motion; although Jen is beautiful, the most beautiful thing about the picture is her dad’s expression. This is all about love! The walk is over and the marriage begins. But she didn’t find it easy while being overcome by emotion; it was such a moving moment. The wedding progressed to a lovely handfasting ceremony aided by both mums. The setting was just beautiful, and it was so nice to see a humanist ceremony carried out in Glasgow University’s chapel. And another of the beautiful bride. Since both mothers helped with the handfasting ribbons, both fathers had to take a turn in something! Bringing the whisky to the party was a tough job, but they stepped up to the plate, specifically the bowl, or quaich in this case. The proceedings came to a close with the signing of the documents. All of the marriage over, and Stuart and Jen now happily joined, they walked down the aisle as husband and wife…how lovely. The family then walked around to the quadrangle to enjoy some family pictures. Photographically, the bright overhead sun was a challenge, with the aperture being closed down a little in consequence, and the depth of field being a little fuller than I would have chosen, however, the background is lovely, so it wasn’t a problem. My 5D with remote flash was used and the trusty Sigma constant f2.8 zoom. I particularly love this one with the light picking out Jen’s dress details. These were such lovely family images, and Jen and Stuart’s families were simply amazing to work with. As ever, even with an intimate group like this, I prefer to photograph the whole group first, then do the subgroups before people wander off. I particularly love the closeness of the family. I think the pictures show that so beautifully. However, the last challenge for the photographer, is some formal photographs of the bride and groom. Jen was really keen to be photographed in the university cloisters. The photographic challenges were the tourists wandering through at frequent intervals, (occasionally, understandably, wanting to take the lovely couple’s pictures), and the bizarre random desks scattered throughout the cloisters. Even with these hurdles, working with such lovely, in-love people as Jen and Stuart in such a great setting, only took a little patience to transform into magical images. This was a brief but beautiful wedding, and I wish Jen and Stuart all the happiness in the world. Having met them a couple of times now, I’m sure that they will be great together. Photographically, this was a really interesting wedding; for a long time now, I have been using my Canon 5D and 7D with off-board flash exclusively for any serious occasions. For the last three years I have been using an Olympus OMD-10 mk2 and now the similar but even better specified OMD-5 mk2 for all of my personal photography, and I simply love them. In brief, their sensors are smaller and less capable in low light, as well as limited to a greater depth of field than my Canon DSLRs, however, the lenses are smaller and stellar in quality, and I love them. I finally decided to use both bodies, the Olympus and the Canon 5D together. The traditional big outdoor shots benefited from the large sensor of the 5D, and the indoor shots during the ceremony, were better for the silent shutter setting in the Olympus. I have experimented with the Olympus for off-board flash shots during a reception as a guest recently, and found the shots great, even given its limitations. The bottom line is, with great lenses, which I have, I would happily shoot the whole wedding on an Olympus micro four-thirds setup; in fact, the next time I shoot one I will. Some of the formal family shots were backups with the Olympus just in case, but I didn’t use off-board flash just to simplify my safety-net, but the shots were good (with flash they would have been amazing). Next time I will be ready, and I believe I will enjoy the photography all the more for it.